Nissan already has a plant in Aguascalientes, Mexico, pictured here in 2013. FRANKFURT (Reuters) -- Daimler and Renault-Nissan plan to invest 1 billion euros ($1.36 billion) to develop compact cars and build a factory in Mexico, the companies said today, in a step that deepens cooperation between the Mercedes-Benz and Infiniti brands. The plant will have annual production capacity of 300,000 vehicles. The factory will start making cars in 2107 for Infiniti, Nissan's premium brand, followed by the manufacturing of Mercedes cars in 2018, the companies said in a joint press release. The companies did not specify which vehicles would be built at the plant, which will be in Aguascalientes, 500km northwest of Mexico City. 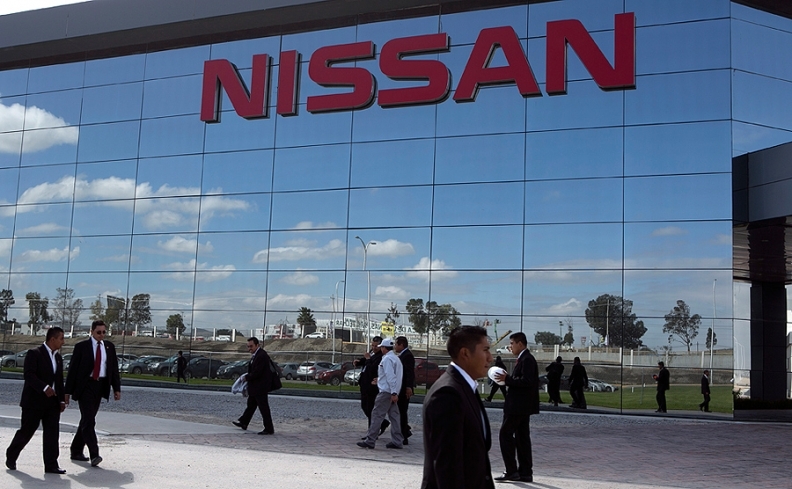 Nissan already has a factory in Aguascalientes. But sources told Reuters that Infiniti will build three models at the plant including a sedan, a coupe and a compact crossover likely to replace the slightly larger QX50 model. Mercedes plans to produce at least three corresponding vehicles, including a crossover from new joint vehicle architecture, developed from Daimler's MFA front-wheel-drive platform. The companies said Mercedes and Infiniti will collaborate on advanced research, design and production of premium compact vehicles. Renault-Nissan CEO Carlos Ghosn said the models also will be built in other factories around the world separately by the partners. Daimler CEO Dieter Zetsche said Mercedes and Infiniti are working closely in advanced research and design to ensure that the future cars will differ from each other in design and specifications. In September last year, sources said the companies were considering the site for joint production of the Infiniti Q30 compact car and Mercedes GLA. Reports have also said that Mercedes is considering building an A-class sedan and the CLA coupe-styled four-door at the factory. The project has been in the works for several months. The 50/50 joint venture allows Nissan to build cars on underpinnings that are already used by Mercedes. In return, Daimler gets a first North American production site for compact vehicles, to supplement its U.S. assembly plant in Vance, Alabama. Daimler has struggled in the past with insufficient demand for small cars. Building cars in Mexico allows Mercedes and Infiniti to sell cars in the United States while avoiding some of the currency and tariff costs that crimp profits on vehicles imported from overseas. Mexico also offers lower labor rates than Germany, Japan and the United States. Ghosn said joint compact vehicle development and joint production in Aguascalientes represent one of the largest projects in the four-year-old partnership between the Renault-Nissan and Daimler. The companies will add almost 5,700 jobs by the time the plant reaches full capacity, expected in 2021, as well as 10,000 jobs at parts suppliers and related enterprises. Nissan, Mercedes and Renault have shared engines, plants and vehicle underpinnings for small cars since Zetsche and Ghosn forged an alliance in 2010 cemented by token reciprocal shareholdings. Nissan and Daimler began working together on vehicles and technologies in 2010, and the relationship continues to expand. This year, Daimler will launch production of jointly developed new-generation Smart two- and four-seat vehicles, with Renault receiving its own version of the platform as the Twingo. Daimler is following Audi's move to produce in Mexico. Audi plans to start assembling sport-utility vehicles in San Jose Chiapa in 2016. BMW is considering sites in Mexico for a new North American factory, Bloomberg reported. Asked if Infiniti cars eventually could be built at Mercedes factories in Europe, Ghosn said "there is no need." Nissan will start building the Q30 at its plant in Sunderland, England, next year. Zetsche was asked whether he would consider a full-blown merger between the companies and said, "The cooperation is so successful because it is not the result of a merger."